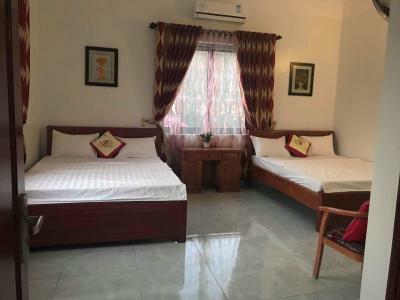 Featuring a garden, Quỳnh Trang Hotel is located in Lạng Sơn. All rooms have a flat-screen TV with satellite channels and a private bathroom. Free WiFi is included. At the hotel, each room includes a closet. Quỳnh Trang Hotel has certain rooms with mountain views, and the rooms include a electric tea pot. At the accommodation, every room comes with a seating area. Languages spoken at the reception include Vietnamese and Chinese. When would you like to stay at Quỳnh Trang Hotel? House Rules Quỳnh Trang Hotel takes special requests – add in the next step! We need at least 5 reviews before we can calculate a review score. If you book and review your stay, you can help Quỳnh Trang Hotel meet this goal.